In the debate over marriage, man-woman marriage is often referred to as “traditional marriage” by both liberals and conservatives alike. For example, it’s very common to hear conservatives speak of the need to “preserve traditional marriage.” Our use of language concerns me. What we call something, and how we refer to something reveals a lot about the way we think of that thing. In this case, the way we refer to marriage reveals a lot about the way we think of marriage, and the way we are arguing for our viewpoint. I submit to you that part of the reason we are losing the battle over marriage is the fact that we are grounding marriage in tradition rather than biology; in social norms rather than human nature – as evidenced by the way we speak of and describe man-woman marriage. 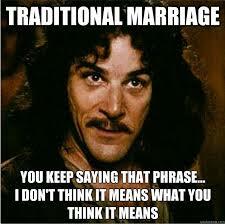 I propose that instead of speaking of traditional marriage, we should start speaking in terms of natural marriage.